If you haven't had the chance to watch the BBC version of Robin Hood you are missing out! I came across this television series while adding some of the 450+ movies on my Netflix account that I will never watch. Luckily, this one made it to the top! "Filmed in Budapest, Robin Hood is a unique blend of exhilarating action adventure, wit and romance. Robin Hood's striking new look (no tights), coupled with the sharp scripts, updates the popular legend for a sophisticated contemporary audience. Full of action, humour and romance, Robin Hood outwits and delights us as he fights the authority of the evil Sheriff of Nottingham with outrageous scams and incredible swordplay." Season 2 ended December of 2007 and Season 3 will begin again sometime in 2009. The writing overall is great. There is some humor that I just don't get, but overall it is very enjoyable and not overdone as some shows do to try and make something funny that clearly is not. 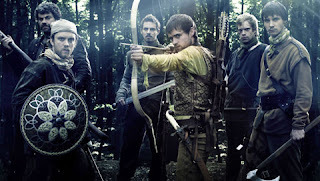 This television series adds depth and detail into Robin Hood's life before he was an outlaw as a noble and afterward as he tries to stop the Sheriff of Nottingham. 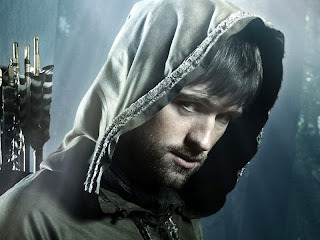 Jonas Armstrong plays Robin Hood and is amazing with his clever wit and charm. Lucy Griffith, who plays Marian, perfectly portrays an "innocent" nobles daughter and still gives the believability that she truly could be a rebel with a similiar cause to Robin Hood's. The rest of the cast is excellent as well. There are some characters that you want to slap, others you want to hug, if you are that type of person, and others you really relate too. As I said in the opening statement, if you haven't seen Robin Hood done the BBC way go find and watch it today! You won't be dissapointed! Oooh, it does look good! Too bad I canceled my Netflix a couple months ago. This sound like "My kinda thing" I will be sure to check it out. Thanks for the tip!